Cyclopam Tablet is the combination of Paracetamol, Dicyclomine, and Dicycloverine. It is used to treat, prevent, and control different conditions such as irritable bowel syndrome, pain in stomach, period pain, fever, headache, toothache, cold, joint pain, abdominal pain, and other conditions. Cyclopam Tablet is manufactured by Indoco Remedies Ltd and it is a prescription based medicine. Your doctor may prescribe it for other conditions. Following are some of the side effects associated with the use of this drug. This is not a complete list of side effects related to this drug. Consult your doctor. In case of Hypersensitivity reactions. It is not recommended for children & neonates. Do not take paracetamol if you consume alcoholic beverages every day. Should be used with caution in Liver and kidney Disease. If you have cardiac tachycardia and congestive heart failure. Cyclopam Tablet is a combination of two medications: dicyclomine and acetaminophen, which relieve abdominal pain and cramping. Dicyclomin is an anticholinergic that relaxes the muscles of the stomach and intestines. It stops sudden muscle contractions (cramps), relieves cramps, pain, bloating and discomfort. Paracetamol / acetaminophen is an analgesic (analgesic) that blocks the release of certain messengers that cause pain. When It is combined with other medicines and consumed, the risk of drug interactions is high. The effects of all drugs are lost or their salts react and lead to undesirable results. The same case can occur when cyclopam is consumed in certain diseases. The usual recommended dose is 80 mg per day, in 4 divided dose. Should be consumed 1 hour before meal. For children, the dosage should be prescribed by a doctor as per the condition. 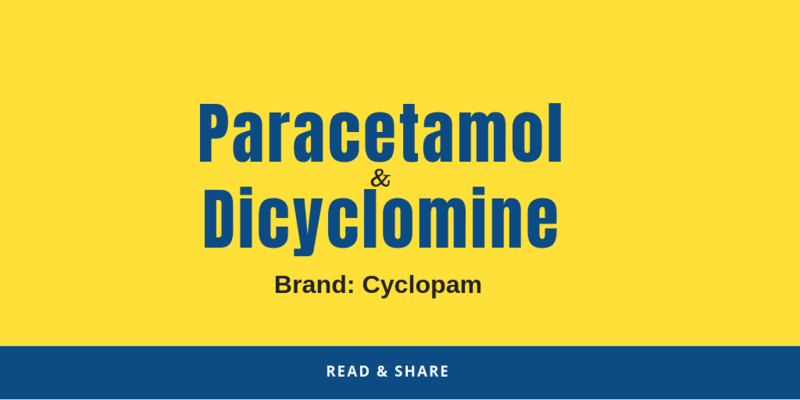 Cyclopam is the brand name of a combination of two active ingredients such as paracetamol and dicyclomine. Paracetamol is an analgesic while dicyclomine is an antispasmodic drug. 2. What are the uses of cyclopam tablet? It is used to treat irritable bowel syndrome, stomach pain, fever, headache, toothache, cold, joint pain, abdominal pain, etc. Check above for more. 3. What are the side effects of cyclopam tablet? some of the side effects assocaited with the use of cyclopam tablets are Dizziness, Drowsiness, Dry mouth, Anxiety, Excitement, Nausea, Lethargy, Vomiting, Feeling of sickness, Dryness, Confusion, Constipation, Blurred vision, Weakness, Decreased sweating, Nervousness and Headache. Check other side effects above. 4. How long does it take for Cyclopam to work? Most users of Cyclopam Tablet had relief and symptom relief within 24 hours after using Cyclopam. The effect depends, among other things, on the severity of the disease and the dosage. 5. How to take cyclopam? It may be given at any time according to the doctor’s recommendations. It can be taken before, at or after meals. You should make sure that you do not consume the drug as a whole. Cyclopam should not be chewed, crushed or broken. Take this medicine at the dose and time recommended by your doctor. Swallow it as a whole. Do not chew, crush or break. These tablet can be taken with or without food, but it is best to take it at a fixed time. 6. How does cyclopam work? The paracetamol in the drug belongs to the category of analgesics and antipyretics. It blocks the synthesis of cyclooxegenase, an enzyme already present in our body. This enzyme triggers the synthesis of Prostglandins, which causes pain, inflammation and redness. While Dicycloamine belongs to the category of cholinergics. It acts as a muscle relaxant and helps to relax the presence in the stomach and intestines (intestines). It works by preventing sudden muscle contractions, also known as cramps. It helps with pain, bloating, cramps and discomfort. 7. Is Cyclopam Tablet safe to use when pregnant? This medicine contain dicyclomine which is not recommended in pregnant women. However take if it is prescribed by your gynecologis. 8. Is cyclopam tablet safe while breastfeeding? This drug is not safe in breastfeeding women because it dicyclomine which is contraindicated in breastfeeding. This drug may cross into milk and can harm your baby. 9. Can Cyclopam Tablet be used for periods pain? Yes, One of the listed indication of this drug is to provide immediate relief to patients suffering from menstrual cramps and abdominal discomfort during periods. Although it provides relief from the above-mentioned symptoms, a doctor must be consulted before consuming this medicine. 10. Can I take Cyclopam to relieve pain after a miscarriage? Yes, most of the time, the doctor prescribed it to relieve the pain caused by miscarriage. abdominal pain. Always ask your doctor before using this medicine because it tends to cause serious side effects. 11. Should I use the Cyclopam tablet on an empty stomach before or after a meal? This medicine can be taken with or without food. However, it is advisable to consult your doctor about this. 12. Is it safe to drive or use heavy machinery when using this product? The tablet can cause blurred vision, dizziness, drowsiness as a side effects. Patients are advised not to drive or work with machines after taking Cyclopam. 13. Is this drug or product addictive or addictive? No, Tablet of Cyclopam is not addictive. You need to read the drug package carefully to get all the information. 14. Can Cyclopam be prescribed for patients with kidney problems? This can be given to patients with kidney failure. The dosage should be adjusted at the discretion of the prescriber. It is very important for the patient to communicate his medical history to the doctor in order to avoid the appearance of side effects. 15. What happens if I miss a dose of Cyclopam? If you miss a dose, use it as soon as you remember. If it is almost time for your next dose, skip the missed dose and resume your dosing schedule. 16. What happens if I overdose cyclopam? Do not use more than the prescribed dose. Taking more medicines will not improve the symptoms; they can cause intoxication or serious side effects. If you think you or another person may have taken an overdose of this medicine, please go to the nearest hospital or nursing home emergency room. In the event of an overdose, consult a health professional as soon as possible. 17. How to store the Cyclopam tablet? Store at room temperature, away from heat and direct light. Do not freeze medications unless required by the package leaflet. Keep medicines out of the reach of children and pets. 18. Can children be given a Cyclopam tablet? It’s Syrup form can be given to children in administered quantities. A doctor should always be consulted before giving a drug to a child. Self-medication can be more dangerous than beneficial.